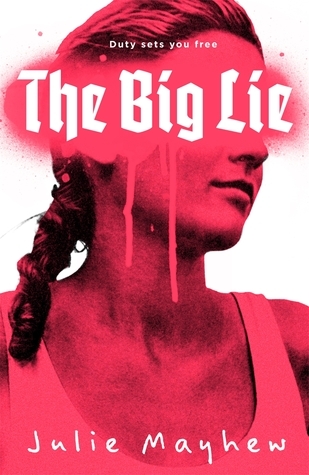 THE BIG LIE is a thought-provoking and beautifully told story that explores ideas of loyalty, sexuality, protest and belief. Really chilling and thoughtful read. I was concerned about reading this book. I love Julie Mayhew's previous book but I am very picky at all about anything with made up Nazis because they can make me really really cross. Throwing the book across the book cross. I am very pleased to say this book did the Nazi side very well indeed and was obviously well thought out and researched which meant I could believe in the world building and get behind the story. The world set up in The Big Lie is a terrifying one. The Nazi state controls everyone and every aspect of their lives. Those who don't conform are treated ruthlessly and as a consequence most who haven't been fully brainwashed into believing in Nazi ideology are too scared to stand up against it and keep quiet to save their own skins. The story itself really made me think as you see the story progress.